Towards the end of the Sprint two important events happen – Sprint Review and Sprint Retrospective. In this post we will explore; understand Sprint Review and break couple of myths around Sprint Review. The Sprint Review happens at the end of the Sprint. At Sprint Review the Scrum Team along with the key stakeholders inspects the Increment and adapts the Product Backlog if needed. This should not be treated as a status update meeting where in the team updates what they achieved or did not achieve during the Sprint to the stakeholders. This is an event for the Scrum Team and stakeholders to collaborate on what was done in the Sprint and on the upcoming things that would optimize the value of the product. The purpose of Sprint Review is to inspect the Increment and adapt the Product Backlog if needed. As every other event, Sprint Review is also time-boxed. The time box for Sprint Review is at most 4 hours for a one month sprint, usually it is shorter for shorter sprints. The event may conclude before the expiry of the time-box if the purpose of the event is met. The Scrum Team i.e. the Product Owner, the Development Team and the Scrum Master along with key stakeholders invited by the Product Owner participate in the Sprint Review. Discussion around the current status of the Product Backlog. Discussion around the feasible dates for upcoming releases or any changes to earlier discussed dates. How the market change may impact the usage of the product and what should be the most valuable thing to do next. Review of budget, timelines and capabilities of the product to optimize the value. The Development Team showcases the work “Done” and answers any related questions. Myth 1: Sprint Review is a demo meeting. One of the biggest myth that revolves around Sprint Review is that it is a demo meeting, where the development team demos the work that they have done to the Product Owner and stakeholders. However, it is just one small part of the Sprint Review. 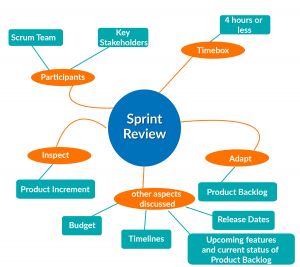 Essentially, Sprint Review is an event where the Scrum Team and Stakeholder collaborate over the product and its potential capabilities taking into consideration factors like market changes, timelines, budget, team changes and so on. Myth 2: Sprint Review is for Product Owner to accept the PBIs. Another myth about Sprint Review is that Product Owner accepts PBIs during the Sprint Review. This notion itself is wrong. With Scrum we believe in iterative and incremental development which fosters faster feedback. The development team does not has to wait till the Sprint Review to get the PBIs accepted by the PO as the Product Owner works closely with the team almost every day. The Product Owner accepts, rejects or provides feedback over the PBIs as soon as the Development Team is “Done” with them and are ready to discuss it with the Product Owner. Myth 3: Only Product Owner gives the demo. When I hear about it a smile comes to me automatically. The Product Owner who has not built the Increment, how could he/she demonstrate the functionality developed during the Sprint? Product Owner plays his/her role of setting the context of what was planned for the Sprint, what as been “Done” as per the DoD and what is not “Done”. The showcase part remains with the Development Team, as they best know how to navigate through the functionality developed. To conclude Sprint Review is an event to elicit feedback from the key stakeholders and make any course corrections as needed. The Scrum Team along with key stakeholders inspects the increment and adapts the product backlog. Agile, Scrum, Scrum Events, Sprint Review. Bookmark.